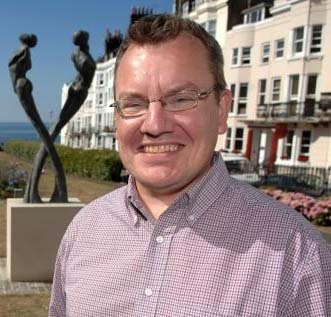 Connections with Brighton and Hove : Chris Cooke was a well-known activist in the Kemp Town and St James’s Street areas of Brighton. He campaigned both for the local neighbourhoods and for gay rights. There was widespread shock when 48-year-old Mr Cooke died in February 2016 following a fire on the 13th floor of the Essex Place tower block off Montague Street Chris Cooke was connected with a large number of organisations He chaired the Eastern Road partnership and the tenants association at Essex Place. He worked tirelessly on neighborhood and community policing. He was a founder member and the first chair of the St James’s Community Action Group and secretary of the area action group... He was active in the Friends of Queen’s Park and organised the Kemptown in Bloom contest. 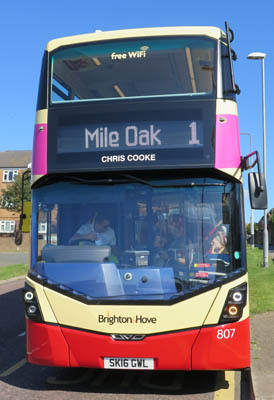 Chris Cooke had chaired the Brighton and Hove LGBT community safety forum and supported the Gay Business Forum. He was a former trustee of Spectrum, the LGBT umbrella strategy group and had chaired the fund raising committee of the Rainbow Fund. He was a columnist for the Kemptown Rag. 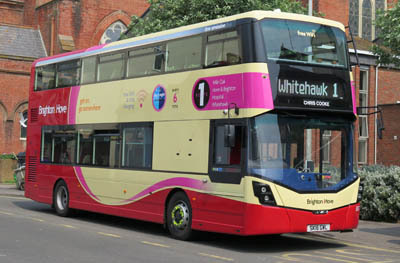 807 Mercedes Streetdeck - carried name since delivery in May 2016 on Route 1.